The Eglu Go Hutch for Guinea Pigs and Rabbits is designed to sleep between 3-4 Guinea Pigs or 1-2 larger breed Rabbits. It is available with a standard 1 metre run for Guinea pigs and can also be purchased with a 2m run for Rabbits. It includes a shade and as well as a hay rack, water bottle and feed bowl. The 2meter run can also be extended by 1m to make it longer to give your Rabbits and Guinea Pigs more space to move round. Accessories such as durable covers and insulation liners can be purchased separately to protect your pets and your Eglu from the elements. 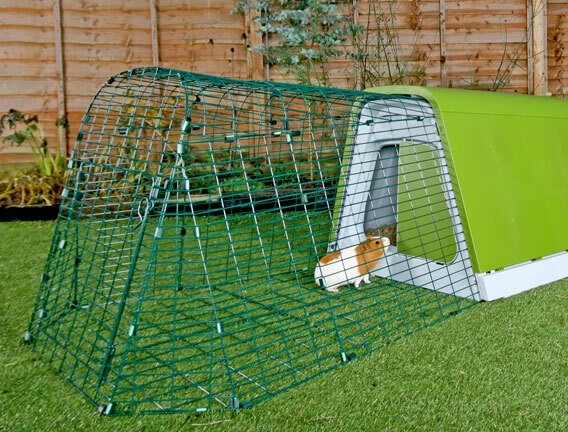 The Eglu Go Hutch is the simple, stylish, straightforward way to keep pets. It has been designed to enable rabbits and guinea pigs to express their natural instincts, offering them a fun environment that will make them feel really at home. The Eglu Go Hutch offers two main areas for your pet to explore. The house is a wonderful hidey-hole to eat, sleep and snuggle up in, and the secure 1m run is perfect for a run around and some fresh air. The biggest benefit of having a hutch and run in one is your pet's freedom to go in and out as it pleases, according to its own routine. The Eglu Go Hutch run is made from strong, steel weld mesh, it is virtually impossible for predators to break, and the removable anti-tunnel wire base will prevent pets from digging out, or foxes from digging in. The unique tunnel-proof panels have been proven in rigorous testing to be fox and badger resistant, so you can be sure that your pets are safe even when you are not at home. The Eglu Go Hutch is specially designed to keep your pets warm in the winter. Its unique twin-walled insulation system works in a similar way to double glazing, trapping a pocket of air between layers to keep the house well insulated. In the summer months, you can be safe in the knowledge that your pets will be kept cool in the Eglu. Its draught-free ventilation system allows fresh air to circulate whilst preventing air from blowing directly over the bedding area. This manual will cover the parts you should receive with your Go Hutch, and step by step illustrated instructions on how to assemble the Go Hutch from start to finish. You will also find advice on how to maintain your Hutch and also tips and hints on keeping and looking after your Rabbit and Guinea Pigs. The total build time for constructing your Eglu Go Hutch is roughly around 1.5 hours.